Dan Martin enjoyed an incredible Tour de France, including finishing eighth in the General Classification standings and winning a stage. When you’re 32 and going into your 12th year as a professional, your beloved sport may not hold the same excitement for you that it once did. But despite being closer to the finish line of his cycling career rather than the beginning, Dan Martin admits he’s “never been so excited” ahead of his 2019 campaign. And who can blame him. The Birmingham-born climber is coming off the back of a 2018 in which he won a stage at the Tour de France on his way to an eighth-place finish overall – impressive considering he was bumped down to 24th after a horrific crash which left his back “looking like a pizza” on Stage 8. Despite finishing outside the top three places in the General Classification, he actually got to climb the podium in Paris after he won the Combativity award, given for aggressive riding. He turned down an offer from Team Sky as well as rumoured interest from Bora-Hansgrohe, BMC Racing Team, Team Katusha-Alpecin and Trek-Segafredo to sign with UAE Team Emirates last year. The Middle East team go into their third campaign on the UCI WorldTour amid a hum of excitement with the likes of rising Colombian sprint sensation Fernando Gaviria and climbing compatriot Sergio Henao joining a stellar cast, including Alexander Kristoff, Fabio Aru, Rui Costa, as well as Martin. 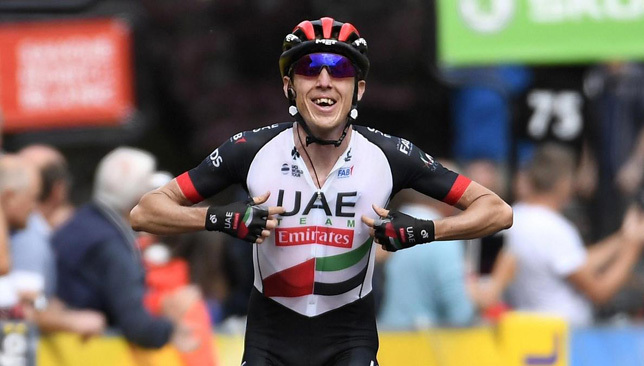 Martin’s Stage 6 win from Brest to Mur-de-Bretagne – an inaugural triumph for UAE Team Emirates at Le Tour – was followed by their second on the final leg, the iconic Stage 21 parade which turns into a sprint along the Champs-Elysees, claimed by Norwegian Kristoff. And after a decent debut with his new team, Martin is predicting even better things to come for a squad impressively replenished in the off-season. “I don’t think I’ve ever been so excited to start a season,” said Martin, who represented Ireland at both the 2008 and 2012 Olympic Games. “It’s a long, long season. And obviously the adaption to the new team took a lot out of me too. This year though I think you’ll see a very different team. “All the mistakes we made at the start of the year that led to us not having the results we wanted, we’re learning and we’re making a huge step forward. I think the UAE is at the forefront of science and technology in the world and right now we’re bringing the team to that level. Even though he may wonder what might have been had he not crashed on Stage 8, Martin insists he looks forward to what can be achieved in 2019 rather than what could have been achieved last year. “It (finishing eighth overall) doesn’t make me want to do better, it just gives me more belief we can podium and maybe even win the Tour,” added the man who began his professional career with Slipstream-Chipotle in 2008. A year for a professional cyclist is a long and grueling one. Riders typically have less than a month off as an off-season. When the WorldTour begins for Martin, UAE Team Emirates and the rest of cycling’s top tier on Tuesday with the Tour Down Under in Australia, it concludes with the Tour of Guangxi on October 20. Dan Martin wins Stage 6 of the Tour de France – a maiden stage win at Le Tour for the team. Even Martin’s off-season couldn’t have been that relaxing. He and wife Jess – a long-distance runner who competed at the 2016 Summer Olympics for Britain – welcomed twin daughters Daisy and Ella into the world on September 19 – “so it won’t be much of a holiday”, Martin admitted to Sport360 while in the UAE towards the tail end of 2018 at a winter training camp, which involved visiting various UAE schools. “It’s a very exciting period in our lives and it will inspire me even more this year,” he added. Martin himself was born five weeks prematurely and suffered from asthma as a child, so some would say he was destined for a life at the pinnacle of a sport that is one of the most demanding on the body. It seems even more inevitable given he was also born into a family of thoroughbreds among the sport. His father Neil is a former pro who was a member of the Great Britain team at the 1980 and 1984 Olympics. Meanwhile, his uncle, Stephen Roche, was crowned Tour de France and Giro d’Italia champion in 1987 and is one of only two cyclists, alongside the legendary Eddy Merckx, to win cycling’s Triple Crown – Le Tour, Giro and the World Road Race Championships – in the same year. Roche’s son Nicholas – Martin’s cousin – is also a pro, acting as a domestique for Tom Dumoulin at Team Sunweb in 2019. But even though he was around the sport and one of its giants from an early age, Martin insists he simply caught the bug, rather than any expectation to tow the family line. “I was exposed to it from an early age. It was on television all over the house and watching my dad go out to race every day, but there was also no pressure to take it up. It was only enjoyment,” insists Martin. “A lot of people put professional cyclists on a pedestal, but to me it was just normal to ride in or even win the Tour de France. Being a professional cyclist was never something that was unachievable. “I hope that’s something these kids draw from, we’re just normal guys. We’re not anything special. OK, we’re good at riding bikes but it comes from training, hard work and riding from an early age. As for emulating the achievements of uncle Steve and finishing his career with a yellow jersey to his name, Martin admits it would be nice, but he’s also proud of what he’s already achieved. “I don’t have much contact with him to be honest. But he’s incredibly proud,” Martin said of his famous uncle. “What we did in the Tour this year, I’m incredibly proud of. Obviously we could have done things smarter, but winning a stage was fantastic. 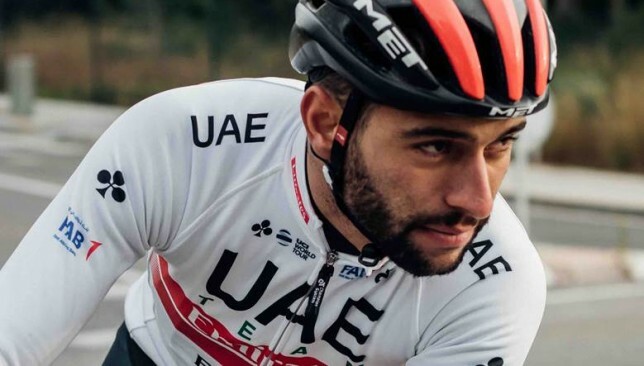 The UCI WorldTour 2019 is less than one-week away and, for UAE Team Emirates, it not only marks their third season as a professional cycling squad on the sport’s biggest stage, but one that promises to be their most successful yet. Their 2018 campaign brought the team a series of high-profile wins across the year, with impressive podiums in one day classics, stage races and Grand Tours – most notably the Tour de France, where both Dan Martin and Alexander Kristoff earned first-place finishes. This year the team has bolstered the squad with even more firepower, bringing in both world-class riders with proven pedigree on the WorldTour and young talent with the ability to grow into stars of the future. The new roster of riders will give the team an edge for 2019, elevating them to the next level with the goal of being one of the most competitive teams on the tour. The new signings have been made possible through the continued support of the team’s existing sponsors, which include local partners Emirates and First Abu Dhabi Bank as well as Emirati real estate development company Emaar, who now feature prominently on the front and back of the team’s jersey. The most notable of the new riders signed during the winter off-season was rising Colombian sprinting talent Fernando Gaviria. The 24-year-old was a two-stage Tour de France winner in 2018 with Quick-Step and is heralded as one of cycling’s most promising talents. Despite his tender years, Gaviria’s winning mentality has seen the powerhouse pick up stage wins at the Giro d’Italia (2017), Amgen Tour of California (2018), Tour of Poland (2016), Tirreno-Adriatico (2016 & 2017) and Tour of Britain (2015 & 2017). Ahead of the new season, Gaviria said: “I’m happy that I’m going to start the new season wearing the jersey of UAE Team Emirates. In addition to the excitement of racing for a new team, I’m really keen to better understand the culture and traditions of the United Arab Emirates and to appreciate how cycling is really growing in the region. Joining Gaviria is countryman and Colombian national champion, Sergio Henao. 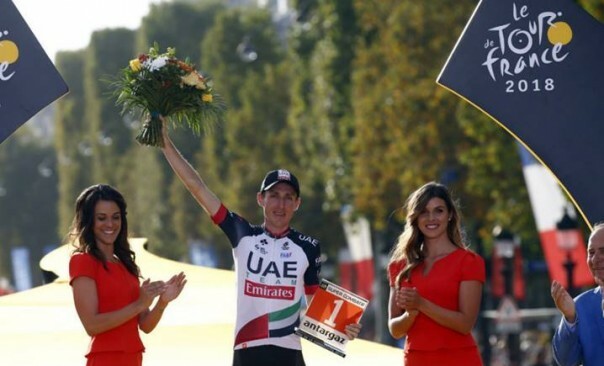 The climber joins UAE Team Emirates from Team Sky, where he secured a number of important wins, most recently the 2017 edition of Paris-Nice which saw him take home the General Classification title. Another Colombian to join the ranks is Juan Sebastian Molano. The 24-year-old had an impressive 2018 season in cycling’s second division (Pro Continental), picking up the General Classification title at the Tour of China and taking first place in the Pan American Championships Road Race. Morning ride for the guys preparing for the @tourdownunder 🇦🇺! He will be looking to make a big impact after stepping up to the UCI WorldTour level. The quartet of Colombian riders is completed by Cristian Munoz. At just 22, he is the youngest to join for the 2019 season, also graduating from a Columbian Pro Continental cycling team. Across the Atlantic, UAE Team Emirates secured the signatures of Portuguese twin brothers, Ivo and Rui Oliveira. The former is the reigning Portuguese U-23 Individual Time Trial (ITT) champion, while Rui is the reigning Portuguese U-23 national road race champion. Another young name to join the Emirati line-up is Belgian Jasper Philipsen. The 20-year-old had an unbelievable 2018 season, picking up a number of domestic wins and becoming one of the most sought after prospects in professional cycling. Capping off the new names is Swiss rider, Tom Bohli. Having spent the last four years with BMC Racing Team, Bohli joins with a wealth of WorldTour experience. Team Manager Joxean Matxin said: “Starting a new season is always exciting, because everything you focused on during the winter break is transferred to the road and you can finally see if all your efforts are rewarded by results. Dan Martin enjoyed an incredible Tour de France, including finishing eighth in the General Classification standings. 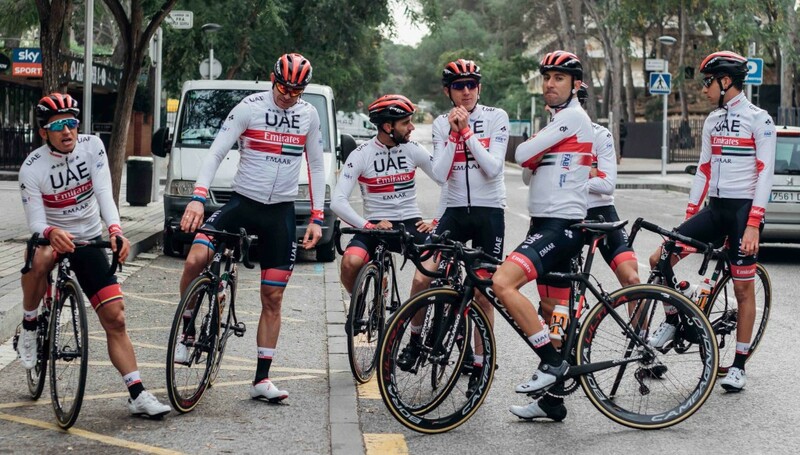 Team CEO Mauro Gianetti added: “This will be our third year as UAE Team Emirates and we have never been more excited or more confident of our potential. “We have signed world class riders – along with some of the best up and coming talent – and they have all bonded extremely well with our existing roster during the winter training camps. The 2019 WorldTour season gets under way with the Tour Down Under in Australia from Sunday. 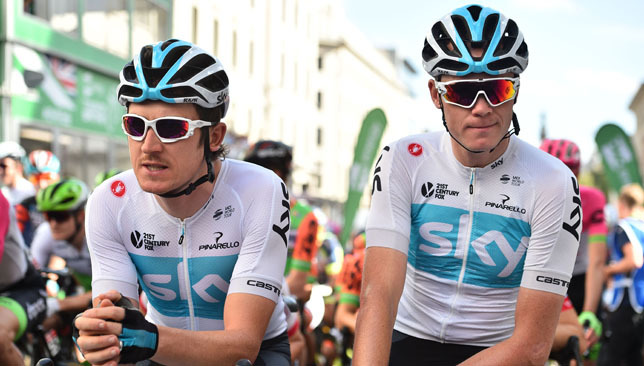 Chris Froome and Geraint Thomas will both target the Tour de France for Team Sky in 2019, with young Colombian Egan Bernal set to lead the team at the Giro d’Italia. Froome will not defend his Giro title as he seeks a record-equalling fifth Tour crown, but Thomas also plans to be in France having won the race for the first time in July.